When you’re a 73-year-old police volunteer who’s known for accidentally (and infamously) shooting and killing a suspect because you couldn’t tell a Taser from a firearm, you’re in a tough spot. The fact that nobody can verify you completed firearms training where you claim you did certainly doesn’t help. And then when your lawyer says the lack of paperwork as far is training is concerned comes from a source he says was recently charged with first-degree murder, things get really weird. 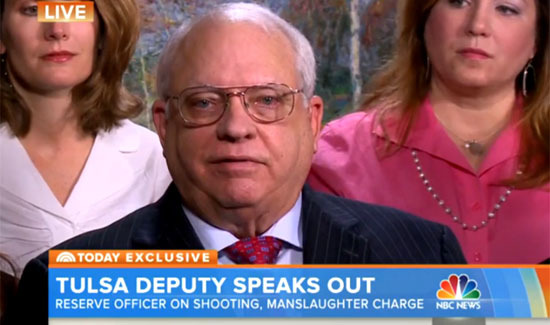 At any rate, the legal team of millionaire police-volunteer Robert Bates seemed to think the best way to go, in terms of protecting his client, was to plead his case via a nationally televised television interview with “Today Show” host Matt Lauer. Phrases like, “you must believe me,” and “it can happen to anyone,” might help the defense and they might hurt—it remains to be seen. The interview seems to raise more questions than it answers, but this is largely uncharted territory. With 400,000 volunteers, many of whom are elderly, playing the role of trained and certified police officers, it’s likely we’ll be seeing more incidents like this one.